Once you know what the blooms in various plant families look like, it becomes easier to nail down specific species. 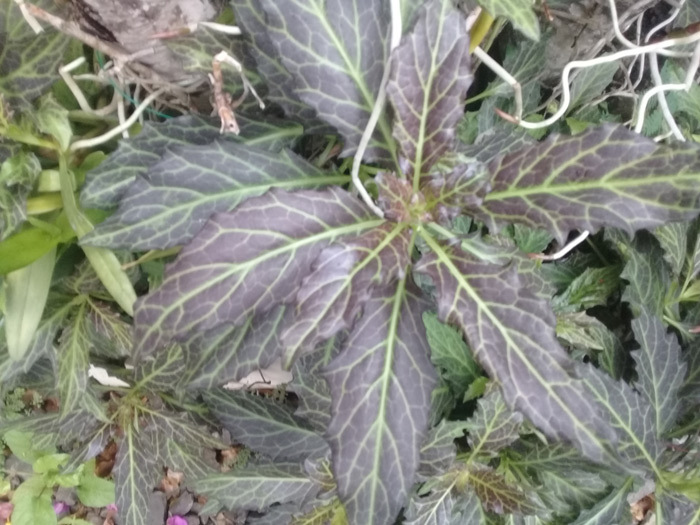 A few months ago I was trying to identify a beach-side plant I had seen many times before without learning its name or uses. It was a big, fleshy, purslane-like plant about 5-6′ tall in a sprawling clump. The flowers were small and white, but distinctive in shape. They looked somewhat like half a daisy flower, or like a little hand-held fan. I tried looking up the species using terms like “purslane-like beach plant,” “fleshy plant white flowers salt tolerant” and “how do you tell if an antelope has rabies” but my searches were fruitless. It remained stubbornly un-IDed. Where I live, however, the language and regional names usually make it impossible to trace back any of the plant names to Latin. 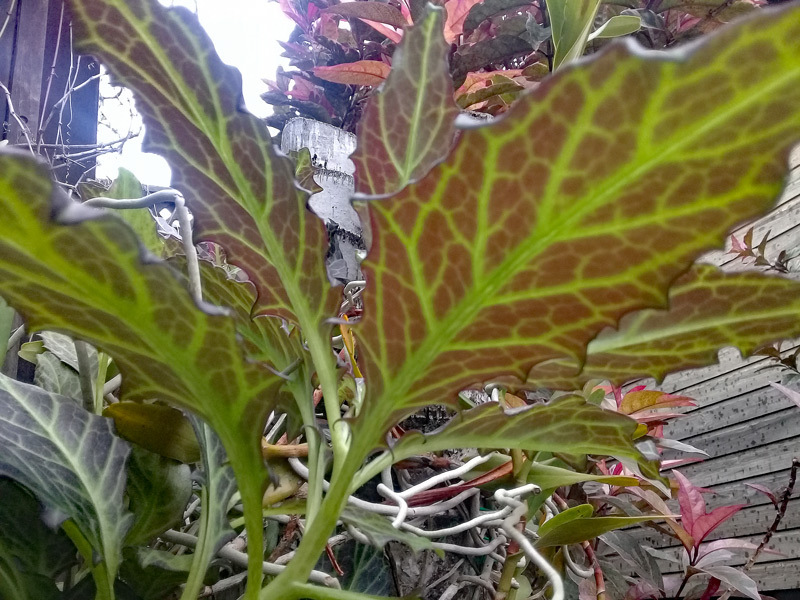 So my plant search stalled and I gave up, until this weekend when I was doing some research on sun-loving tropical groundcovers and came across this post by Phil Dudman at Garden Drum. 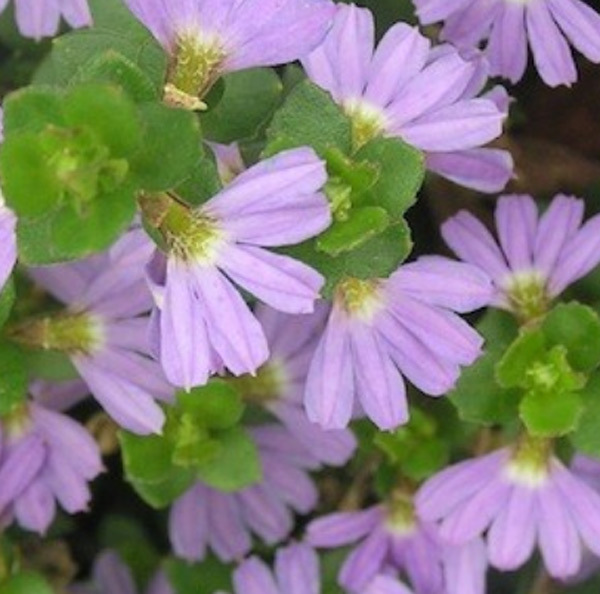 In it, there is a picture of a little blue-flowered plant named “Purple Fan Flower,” with the Latin name Scaevola aemula helpfully provided. Look familiar? I’d say that was a close relative of my mysterious beach plant. 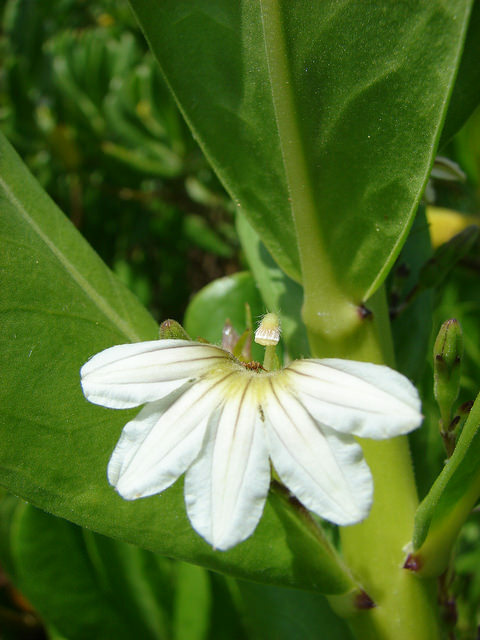 What I did next was DuckDuckGo search “beach scaevola” and I immediately found my purslane-like white-flowered mystery shrub: Scaevola taccada. When someone sends me plant photos asking for ID, I always ask for pictures of the blooms as well, if any. 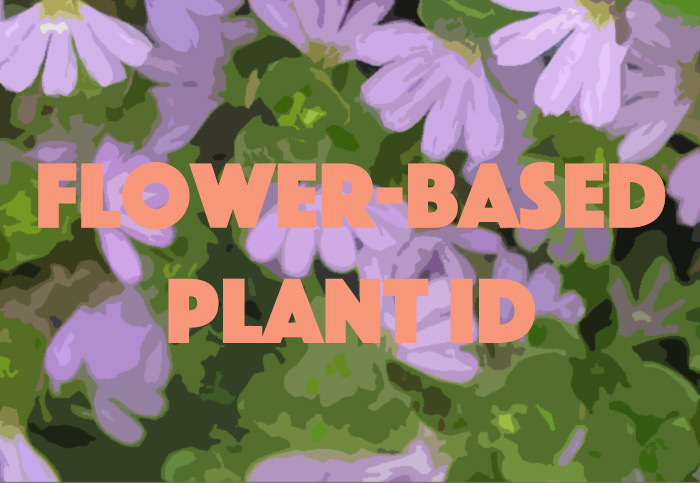 They’re often a dead giveaway on the plant family or genus and take you one step closer to a plant ID. 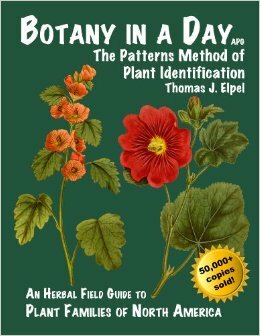 The book Botany in a Day by Thomas Elpel is a good start for this method. Once you start seeing patterns, you keep seeing patterns. If you’ve ever noticed that eggplant, peppers, tomatoes and potatoes all have the same style of bloom, you’re well on your way. If you noticed that caesarweed and wireweed both have blooms similar to the hibiscus in your side yard, you are a super-sleuth. Malvaceae FTW. How did I know it looked like a Gynura? 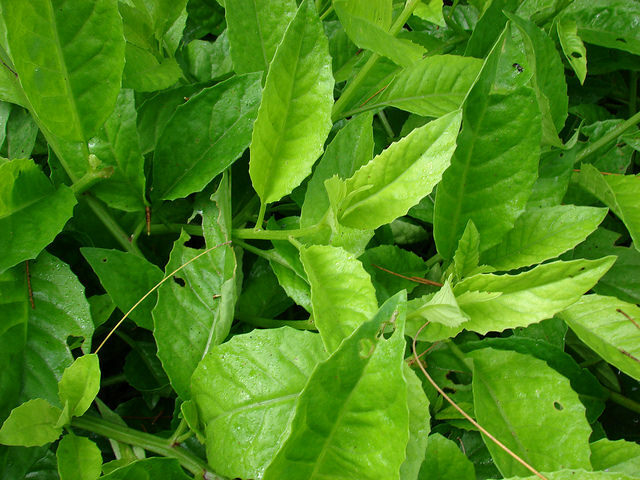 After noting the similarity in looks, I did an image search for Gynura and came across my mystery plant. The blooms are often a dead giveaway on at least the plant family, giving you a good start on plant ID, but you’ll notice other things over time. It’s fun once you get the hang of it, and Elpel’s book, if not quite teaching you botany within a 24-hour period, is a nice springboard into the wild world of plant ID. *Scaevola taccada bloom and longevity spinach pictures courtesy of Forest & Kim Starr of Starr Environmental. CC license. It's RUNNING BAMBOO??? Oh shoot!!! Nice looking flower. I can see why you were so determined to figure it out. Yeah – it does look quite cool. And the stuff fills in along the beach where nothing else wants to grow.